One month down, eleven to go! If the rest of 2018 pans out to be anything like this first month, it’s going to be a very great and also very full year. I dove right into this new year and hit the ground running. Well, that isn’t entirely true: our New Year’s Eve was pretty quiet. We were all fighting colds, so we stayed in and did a family countdown ’til 8:00. Then I tucked my boys into bed by 9 and rang in the New Year myself with some candles, my journal, and a mug of hot cocoa. In other words, this introverted homebody was in Heaven! Despite the quiet beginning, the rest of this month has seen quite a bit more action. My Bible Study and Community Groups are going strong, we’ve been having loads of fun with potty training (cue the sarcasm), we’ve attended and hosted playdates and dinners with friends, and had a whole host of fun adventures (more on that below). Here’s a look at some of January’s big highlights. YA tends to be hit or miss with me; I’m frequently drawn to their premises, and I’m a big fan of shorter novels, so I find myself reading quite a bit of this “genre” (is YA a genre? ), but am often left unimpressed, or simply disturbed by the amount of vulgarity and adult themes. 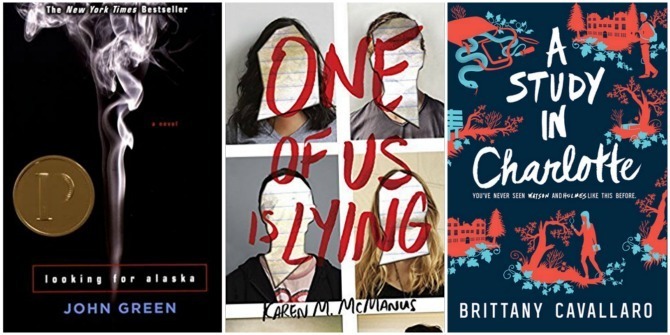 I read three YA novels this month: John Green’s genre-defining debut; a whodunit with a Breakfast Club twist; and a teen version of the Sherlock Homes stories. All three were mysteries, or at least had a mystery component, and while I had issues with some of the content in all three of them, they were each worthwhile reads. I haven’t abandoned books for adults. I’ve had great luck with nonfiction lately, including memoirs from Nia Vardalos and Drew Barrymore (that rendered me a fangirl of both authors); one of the best parenting books I’ve read; and an excellent compilation of essays from some of the world’s best productivity experts. I haven’t decided yet on a book to read for my second Reading Challenge selection (a book I can read in a day). Because the book will, by definition, be short, I’ve been putting it off, but I’m also feeling a little overwhelmed by my options. Should I go with a children’s book? A novella? A collection of short stories? I’d love your recommendations! With the cold weather we’ve ben having, I’ve been guzzling hot tea like it’s my job! (It helps keep our heating bill manageable, otherwise I’d be insisting we keep our home at 80 degrees!) 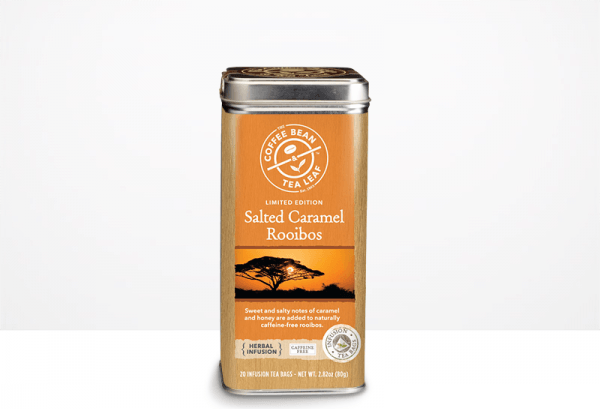 My brother bought me a couple of canisters of this tea for Christmas, and I am obsessed. I’m a huge fan of dessert-flavored teas, and this might be my favorite of all time. It has a rich, creamy flavor and smells heavenly, and it’s surprisingly caffeine free. I was worried it might be a seasonal flavor, so I’m happy to see that it’s still available online; I’m almost out of my Christmas stash, so it will be time to stock up pretty soon. In addition to chugging hot tea, I’ve been turning to warm-weather gear to keep from freezing this month. Thankfully I’ve had a few additions to my wardrobe that have been helping me stay toasty. My brother-in-law gave me this cozy fleece jacket for Christmas, and it’s probably the warmest thing I own. It’s hard to keep myself from wearing it 24/7. Not only is it insanely soft, but the numerous pockets are incredibly functional; I’m starting to see why guys love cargo pants so much! My favorite feature? The thumb loops! Another warm addition to my closet is the sherpa-lined utility jacket I bought on clearance from Old Navy in December. 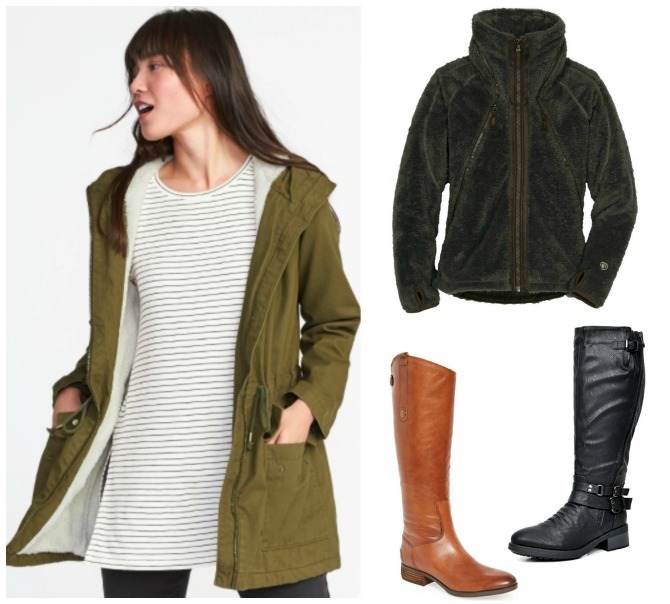 I had been shopping online for Charleston and added the coat to my cart to reach the $50 total needed for free shipping; I haven’t had much luck with Old Navy’s jackets in the past and assumed I’d be returning it, but once I tried the jacket on, I knew there would be no returns necessary. It’s soft, it’s warm, and it goes with almost everything. If you’ve seen me running around town in the past month, I can almost guarantee I’ve been wearing this coat. And then there are boots. Have I mentioned that I have a slight boot obsession? I don’t want to tell you how many pairs of boots I own (but the number rhymes with delve), and I have two new favorite pairs. My in-laws gifted me this pair of cognac riding boots (from my wishlist!) for Christmas, and they are just as dreamy as I knew they would be. And I used part of my Christmas money from my parents to purchase this less expensive but equally cute pair of fur-lined black boots. My feet have never been so stylin’, and now I’ve banned myself from purchasing any more boots until at least next fall. My boy is doing his part to convince me that three is every bit as cute as two. Here’s a snapshot of some of the hilarious things he said this month. We spent a lot of time talking about Heaven—which is awesome, but also has this mama a little nervous because I’d like my boy to stick around here on earth for a while! We started Charleston in gymnastics classes at our YMCA. It feels exciting because this is the first real extracurricular activity he has done, other than swimming. 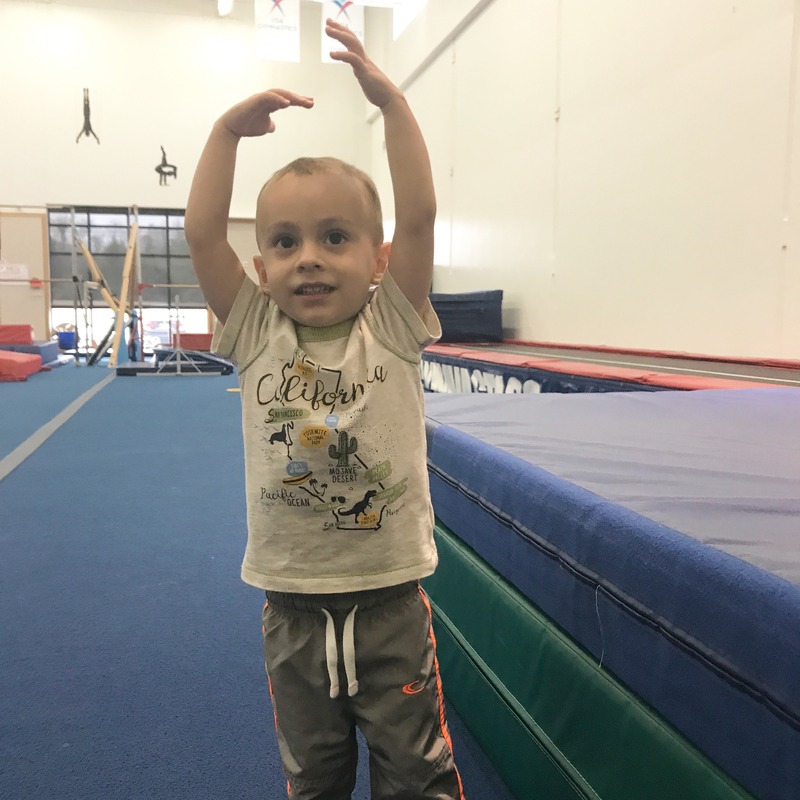 We thought gymnastics would be a great first sport because he’s small, limber, and loves to jump, flip, and move his body. And we were right, he is absolutely loving it! He has trouble slowing down enough to stay on the balance beam or follow the teacher’s exact instructions, but I’ve been impressed with how well he is picking up on the skills he’s learning. All the practice on our backyard trampoline is really paying off. The only downside to gymnaastics is that I have to watch him from behind a window—which means I can’t always see what’s going on, and my pictures are all blurry! My parents came out to visit for the week of Charleston’s birthday and we had the BEST time with them. 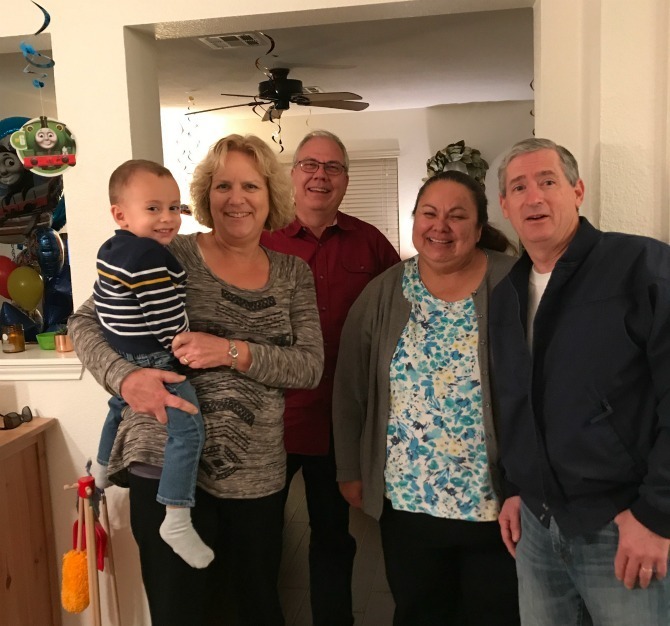 Charleston adores his grandparents and soaked up his time with them while they were here. We also did quite a few fun things around town. We’ve been wanting to check out the Thinkery (Austin’s popular children’s museum) and finally made it! 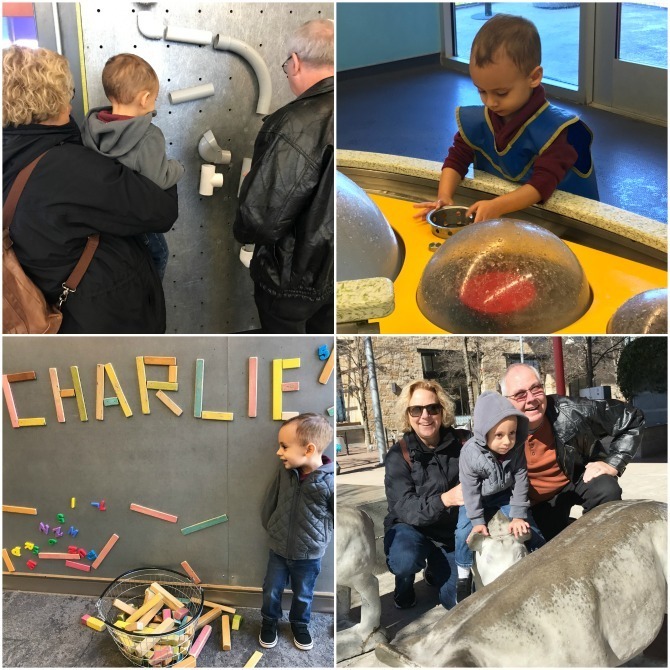 It’s a pretty awesome place with several interactive exhibits, a couple of playgrounds, and various learning centers. Charleston was a little overwhelmed by the numerous activity options, but we still had a lot of fun and look forward to going back. We spent another day of my parents’ visit exploring Downtown Austin. 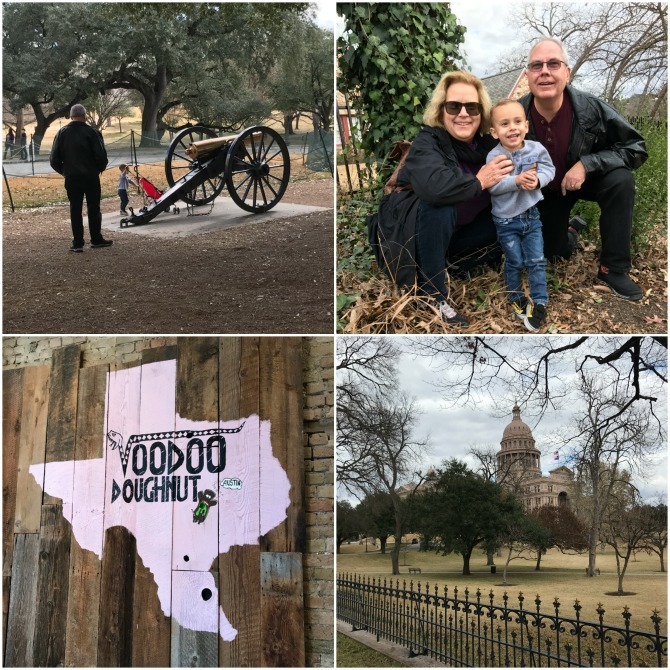 We wandered through the Capitol, introduced them Voodoo Donuts, grabbed lunch at Freebirds, and rode the Zilker Zephyr. 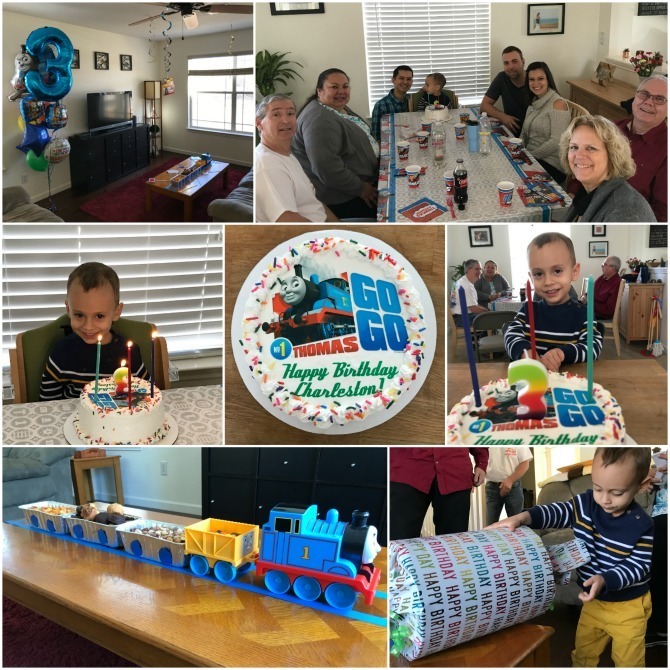 Since my parents’ visit coincided with Charleston’s birthday, they were here for his party! That morning they took Charleston to story time at the library while Luke and I transformed our home into a Thomas the Tank Engine wonderland. It was a small party (the only guests were immediate family) but it couldn’t have been more perfect. Charleston has been asking for a Thomas-themed Menchie’s cake since his last birthday, so he was pretty excited about it—and my little ham beamed from ear to ear while we sang to him. Charleston loved his party decorations and being the center of attention, but more than anything, he loved being surrounded by people who love him. 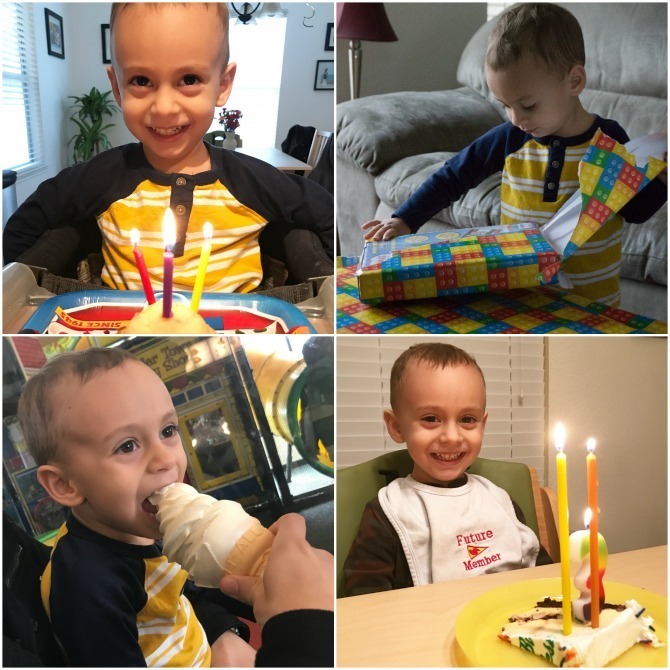 At one point during the party I took him upstairs for a diaper change and he said, “I have to get back to my party!” I asked what his favorite part of the party was, and he started listing the names of everyone who had attended. This is only the second time in the nine years Luke and I have been married that our families have all been together at the same time (the other time was Charleston’s first birthday party), so it was incredibly special for all of us. Charleston’s actual birthday was a little less climactic. We’d planned to take him to the Aquarium, but Austin was frozen in that day, with streets and businesses closed. 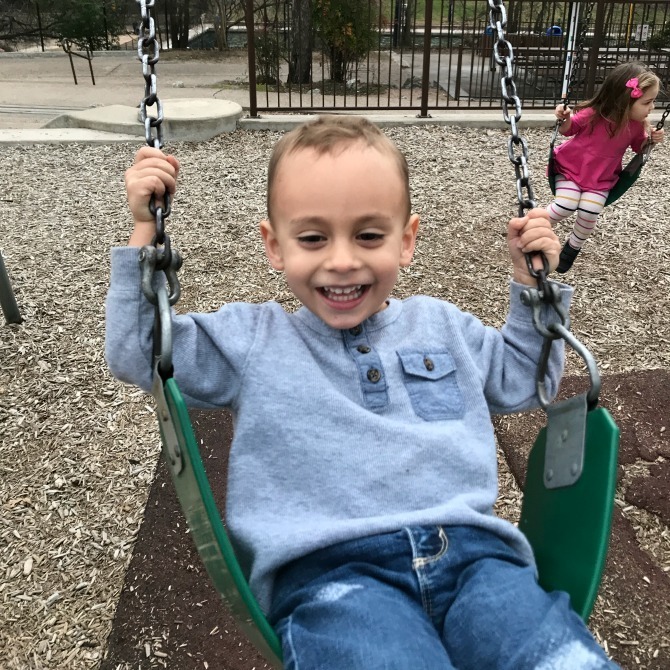 Instead, we spent the afternoon at Chick-fil-A; we had lunch (and ice cream) and he played on the playground while Luke and I hung out with my parents until they had to catch their flight back to California. Then we came home, Charleston opened presents, we played with his gift, and we sang to him while he blew out candles in a slice of leftover cake. 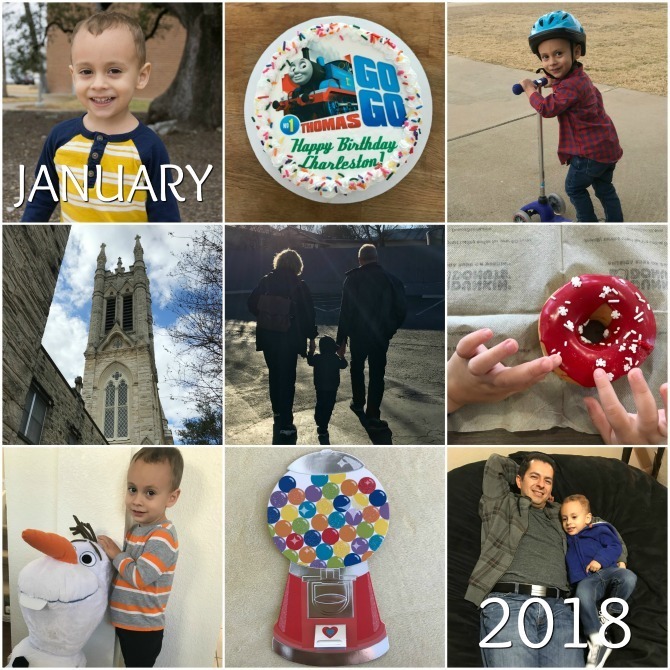 I think he’d say it was a pretty good way to kick off his year of being 3. What a great month! How about you, what were some highlights of your January? 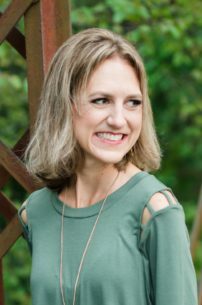 I’m linking up with Leigh Kraemer to share what we’ve been into and up to this month!